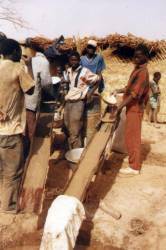 Due to long-term geological activities in the territory, our specialists gained deep and exclusive knowledge of the system and organization of artisanal exploitation (direct participation in organization of primitive mining and gold buyout on the objects exploited by "West African artisanal exploitation"). Our experience with this alternative working method and particularly with organizational, technical and economic limits of gold-bearing ores processing may be considered exeptional. As a matter of experience we proposed classification of artisanal exploitation tailings and dressing and designed and proved practically the simple methodology of exploration and possibilities of utilization of some type products (dumps, tailings etc.) resulting from subsurface mining of auriferous quartz ore. This knowledge is currently verified within the project of interstate assisting (gold-tailings project). The methodics of prospecting is based on the detail knowledge about modes and economic constraints of autochtonous exploitation and treatment. The principle of treatment procedures is adapted for the local conditions and we prefer mainly gravity method of processing based on the detailed knowledge of technologic parameters of particular waste of exploitation and processing. Great advantage of proposed methods of exploitation and processing is mainly very low capital outlay. Preparation of the exploitation and treatment involves building of the field basis and capital-undemanding simple dressing-plants including local workers training. The dressing plant capacity depends on the capacity of the process (raw) water resources. Low exploration expenses and operational costs of exploitation and ore treatment result from once before ascertained and generally applicable regularity of gold distribution in tailings and simple and effective methodics of prospecting and technology of raw material treatment. Needful investment costs are reduced by gold production which gradually increases already since initial stages od exploration. Due to small volume of reserves, legislative conditions and other particulars of the territory, this mining and dressing method is suitable primarily for local private investors (Mali, Burkina Faso, Guinea). Remark: in the case of most localities, very small reserves and low mean gold contents in refuse dumps, dump piles and settling ponds represent economic barrier for their utilization. Copyright © 2002 - 2018 EXPLO-MINE Ltd.